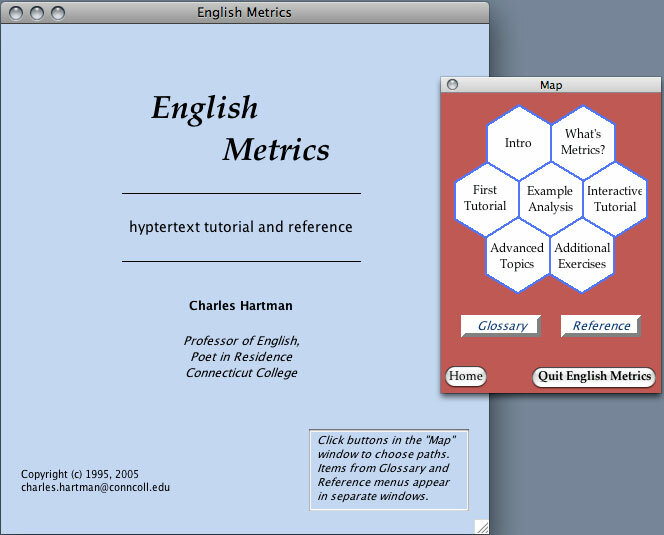 Long ago I wrote a Hypercard hypertextual tutorial on English metrics. (Even longer ago there was a DOS version.) It thoroughly traced the process of scanning iambic pentameter and also included reference and exercise material for a range of metrical patterns. At last there's a modern, cross-platform version. Download either the Mac OSX or the Windows archive file, and unzip (extract) it wherever you like. To run the OSX version, double-click the StackRunner icon. To run the Windows version, double-click the StackRunner.exe program. Either way, when you're ready to quit, notice the Quit English Metrics button in the "Map" window. The tutorial was constructed using Runtime Revolution's Dreamcard development system. The StackRunner application was written by Ken Ray (Sons of Thunder). A few words from a student about installing and using the Windows version: "The process is long but not too difficult. First, download it on to your computer then click on the download. It will lead you to an English Metrics folder and on the left side it will say 'extract all files.' Click on that and then open the English Metrics folder and click on the 'stack runner' to run the program." The Scandroid is a program that scans English verse in iambic and anapestic meters. 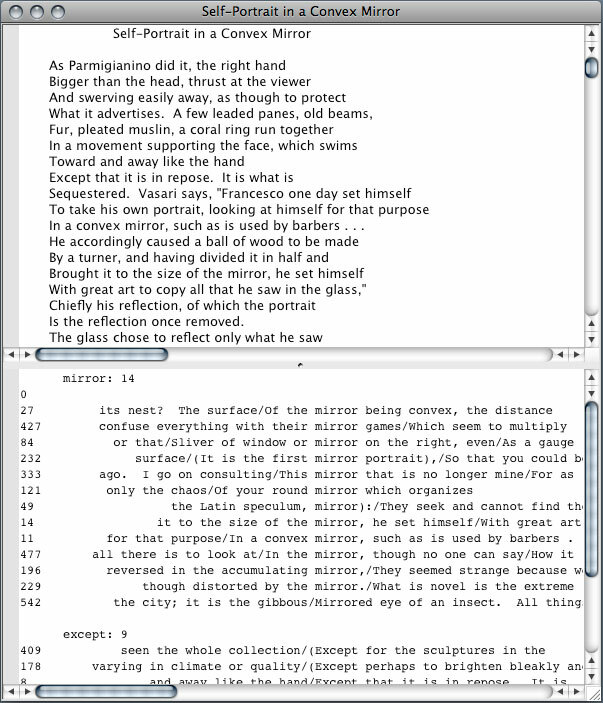 You can load the text file of a poem, or type lines in by hand. As you "Step" through the process, the program explains what it's doing: identifying syllables and lexical stresses, dividing the line into feet and so on. This makes it a self-teaching tool. At the same time, it's suitable for some kinds of research on metrics. Though it uses the traditional foot-based scansion, some of its techniques and principles of construction derive from recent decades' work in generative phonology. There's a Manual that describes both how the program works and why it works that way. I don't know of another program that does quite the same thing. It's fairly successful; it handles Larkin's "Church Going" and Browning's "My Last Duchess" and Carroll's "The Hunting of the Snark" pretty well, and none of them is particularly easy to scan. Its treatment of a word (syllabification and stress) can be changed by the user. 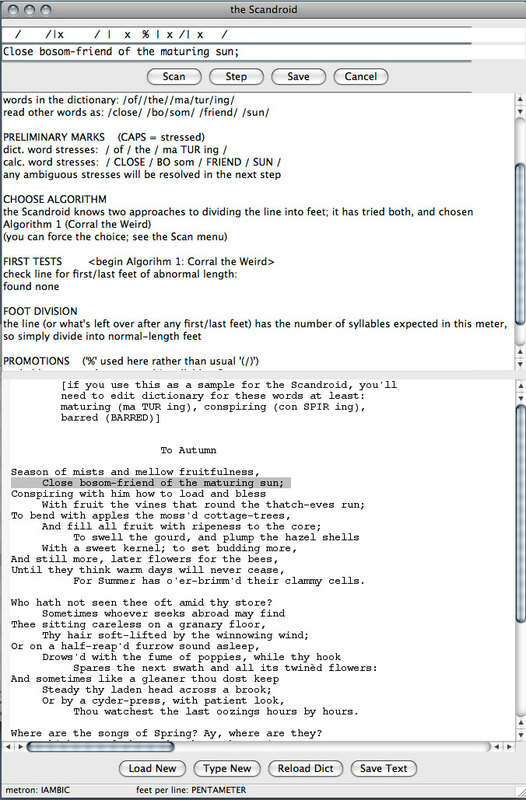 It employs two different algorithms for dividing iambic lines into feet, and another for anapestics; when it loads a poem-file it samples the lines to deduce whether to treat them as iambic or anapestic. Here is the Scandroid for Mac (OS 10.4, probably also 10.3) and Windows (tested on XP, should work on others). The Manual, a 20-page .pdf file, is included in both distribution archives, and is also available here for separate download. It includes some discussion of theoretical issues as well as practicalities. In 1996 Wesleyan University Press published my Virtual Muse: Experiments in Computer Poetry. The book examined a number of approaches to using computer programs as adjuncts to the process of composing poems. The book is now more or less out of print; I am glad to deal with inquiries as they arise, which is surprisingly often. The most elaborate program described in Virtual Muse is Prose. 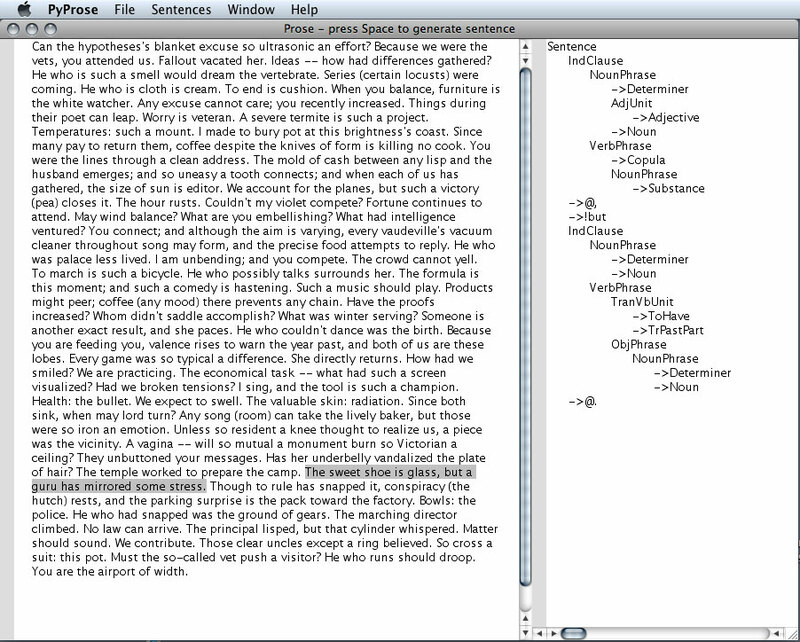 It generates sentences. They are random in two ways: the syntactical structure of each sentence is constructed from phrase elements recursively chosen at random from an editable grammar; and the word-slots in the resulting sentence template are filled at random from an editable dictionary arranged by word-types. It was originally written under DOS; that version is accessible by archaeologists. The same is true of the old Mac OS9 version, which used Jim Trudeau's Programming Starter Kit for Mac. A nice new version is now available for both Mac OS 10.4 and Windows XP. (It's written in Python, using the wxPython GUI framework, like the Scandroid. Source code is available on request.) Download your preferred package here, double-click to unpack the archive, and try it out. If you find bugs, please let me know. A program called Concord, the Interactive Concordance Generator, is available in both Mac (10.3+) and Windows (XP) versions. It's again in Python and wxPython. Concordances — lists of all the words in a text, with location references and sometimes contexts — were once made by hand, and very few could be made that way. Biblical concordances were achieved by scholars in the nineteenth century. Charlton Hinman's work on mechanical collation (one of many precursors of modern computers) led to good concordances of Shakespeare early in the twentieth century. Programs are available now to do the job on a personal computer, which is a hell of a lot easier. Some of these (such as R.J.C. Watt's Concordance) are clearly more sophisticated than my Concord. Concord has the modest advantage of being, as far as I know, the only such program for the Mac that's free. I think it does smoe other parts of the job especially well, too. It produces a KWIC (Key Word in Context) concordance-entry, more or less instantaneously, for any word or phrase you specify, and it lets you sort your concordance in a variety of ways. It needs a plain-text file for input, but it will accept quite a large one, such as the King James Bible (4.3 megabytes). It can deal with no-Latin alpabets — moden Greek, anyway. A nifty new vesion (0.9) is available now for Mac. A Windows veson wll come aong when I've gotten help building it.